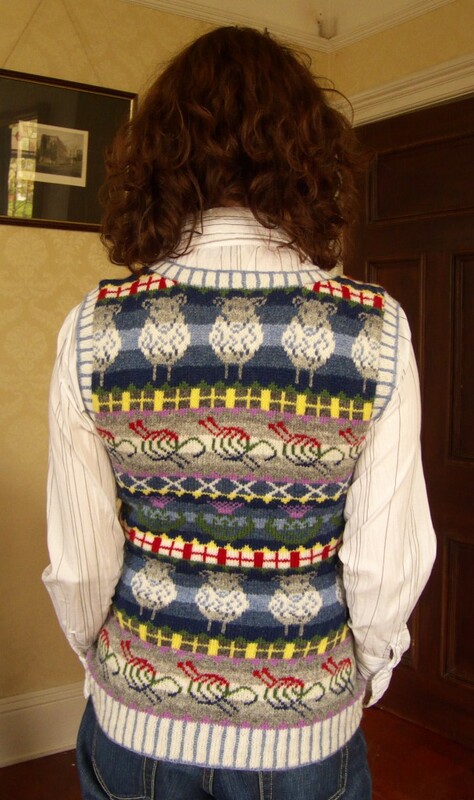 This lovely scoop neck pullover features sheep, needles and yarn, a choice of national flowers (roses, thistles, daffodils, or shamrocks) and flags of the patron saints of Scotland, England, Wales, and Northern Ireland. Side shaping and mitered armholes create a flattering fit so that you can show off your sheepy love with style! The pullover is knitted seamlessly in the round from the bottom up. It includes steeks for the armholes, and for the front and back necklines. The pattern provides full written instructions for each stage of the project, and a chart for the stranded fair isle pattern. For guidance with the advanced knitting techniques involved please see ‘Tutorials’. The pattern is graded for a range of ten sizes, from 32 to 50 inch chest circumferences. After blocking the pullover has 2.5cm/1″ of positive ease at the chest. If knitting the daffodils you will also require one ball of shade # 2 (orange). Suggested needle size is 3mm/US 2½ circular needles, or the size required to get tension/gauge. This is 32 stitches and 40 rounds per 10cm/4″ in stranded pattern. For the armhole and neck edgings you will need a 2.5mm/US 1½ needle that is 80cm/32″ long.